There’s been a flurry of bulb-planting activity here the past few weeks. 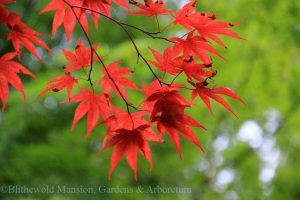 Fall is like a mirror image of spring for a gardener. Everything you worked so hard to create is taken apart and put to rest for the winter. 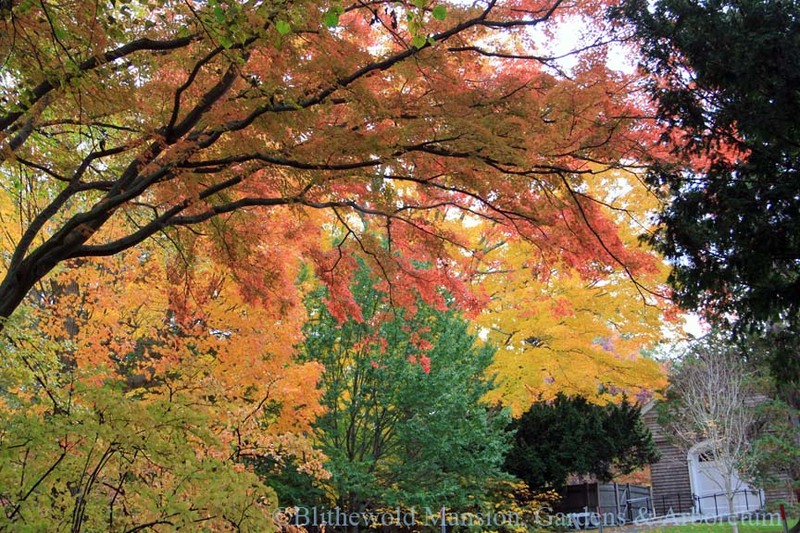 Sometimes it’s hard to say goodbye to the gardens in October. This year I was ready. I love our garden creations deeply, but the time was right to bring the growing to a seasonal end. Planting tulips, allium, dwarf iris, and camassia was our final investment before the winter. 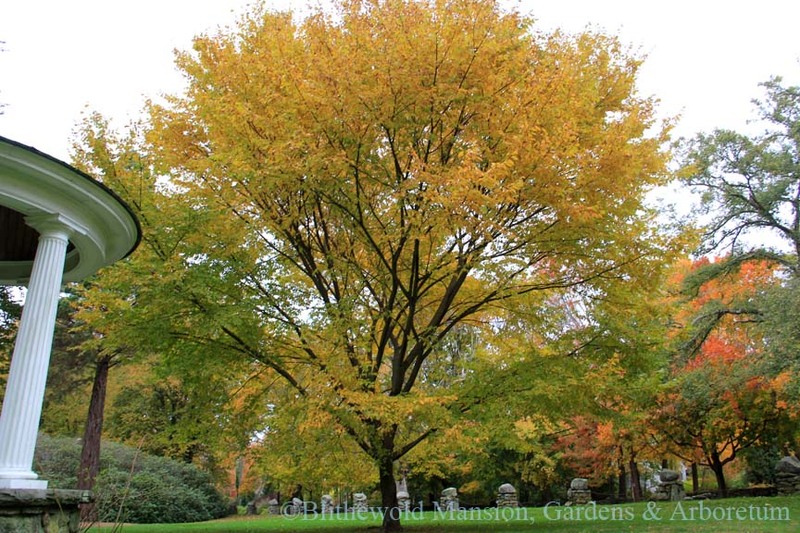 We planted over 8,000 bulbs throughout the gardens this fall. Needless to say, there will be some amazing flowers to see this spring! We are looking forward to it. In the meantime, I lean into fall as much as I can while dreaming of spring bulbs every night. (No joke, I actually dreamt of tulip bulbs this week.) It’s not too difficult to pull my head down from the spring clouds into the sweet earthiness of fall, especially with all the glorious foliage that abounds across Blithewold. This perspective of the trees at the top of the drive looking at the back of the Visitors Center has long been a favorite of mine. October and November only sweeten the view. There are so many beautifully intersecting branches and colors. It’s almost color overload. 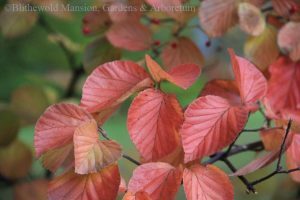 Just below this lovely view sits some viburnum with their own fall beauty. 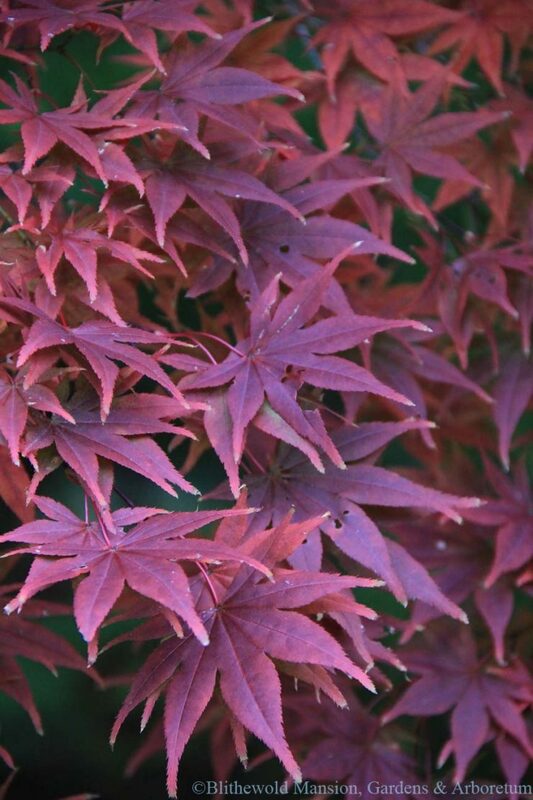 The subtle rosy-red leaves are punctuated by red berries that almost seem to float above the foliage. 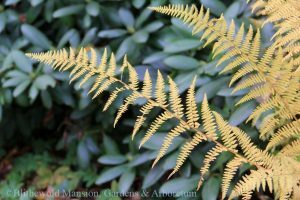 I’ve also been enjoying an atypical choice for favorite fall foliage – ferns. These hay-scented ferns (Dennstaedtia punctilobula) are glowing green and gold along the Primrose Path bordering the Enclosed Garden. 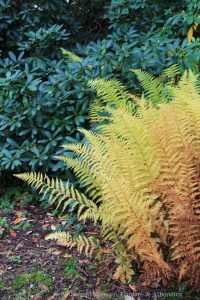 The path is mostly quiet at this time of year, so the fern’s brilliant color really stands out against the deep green of the rhododendrons. Not too far from there around the Enclosed Garden are the Japanese maples. Every year they never fail to disappoint. I enjoy the juxtaposition of the colors. The golden green on the left is just as beguiling as the truly brilliant red on the right. How to pick a favorite? 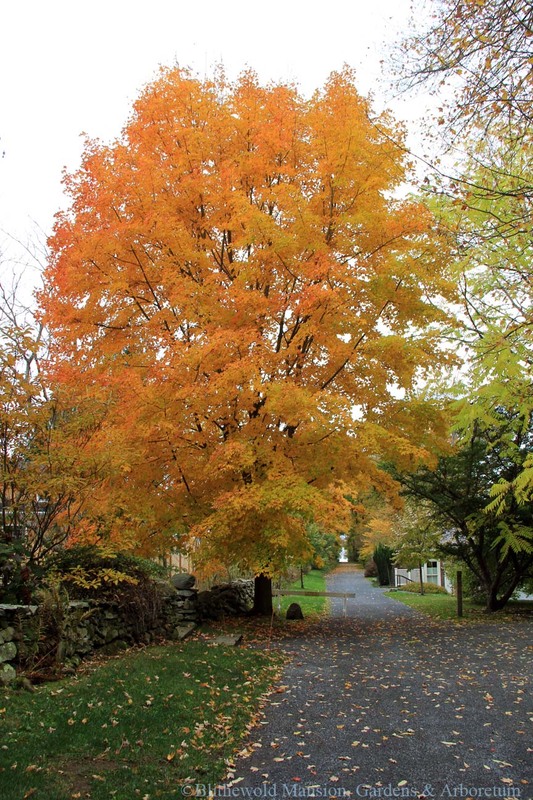 Okay so speaking of maples, how does anything compare to this sugar maple (Acer saccharum)? It has been showing off big time this week. I can’t help but be drawn in by this tall beauty. It’s like a big welcome sign for Love Lane. 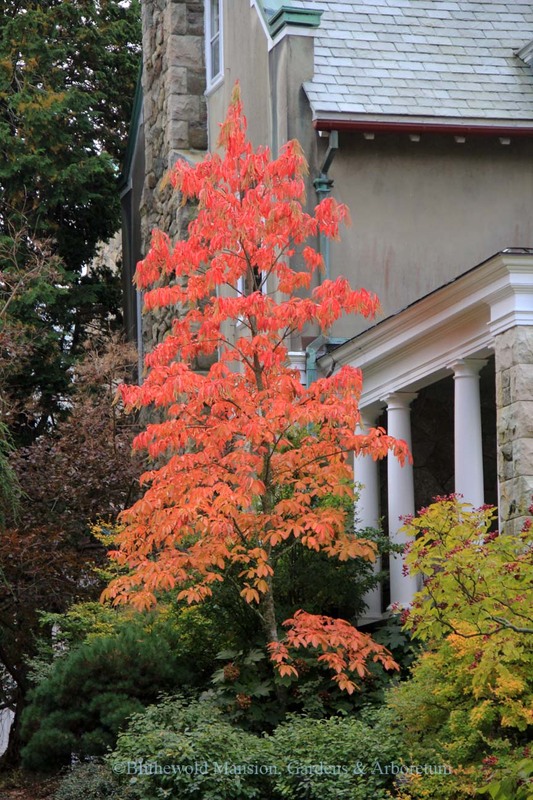 Another show off is the sourwood tree (Oxydendron arboreum) growing right next to the house above the North Garden. How is this color even real? 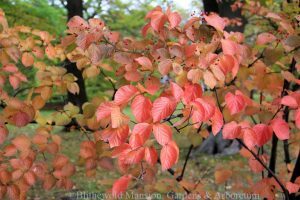 Missouri Botanical Garden says the sourwood’s “leaves produce consistently excellent fall color” and I can’t help but agree. I look forward to this tree changing color every fall. If you haven’t had the privilege of seeing this tree in person, be sure to check it out the next chance you have. 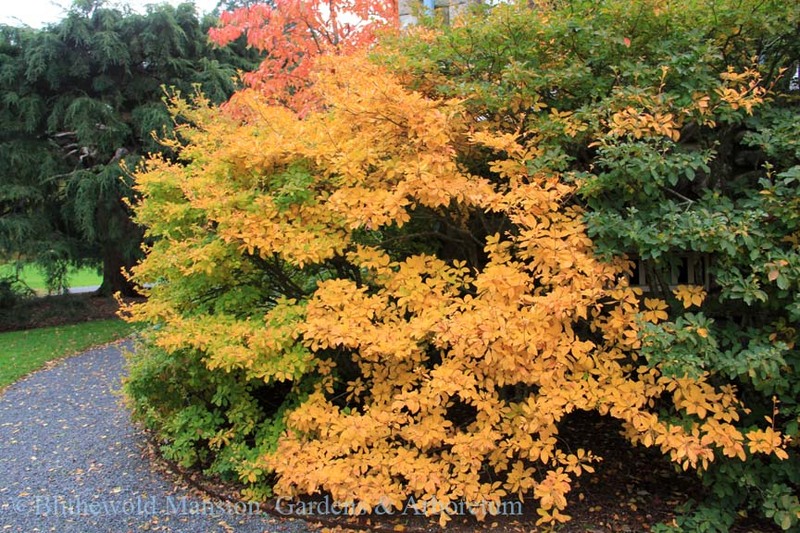 redvein enkianthus changing color in patches. Right around the corner from the sourwood is the redvein enkianthus (Enkianthus campanulatus). I love the enkianthus in spring when the red, pink, and white bell-shaped flowers emerge, attracting honey bees to their sweet nectar. In the fall it is equally stunning. 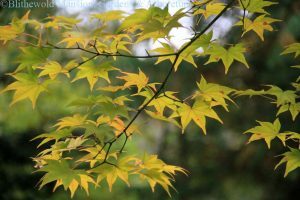 I want to end this blog with some fall foliage that might fall under the radar. The dove tree (Davidia involucrata) is most often photographed in summer when its showy white bracts are a sight to see. 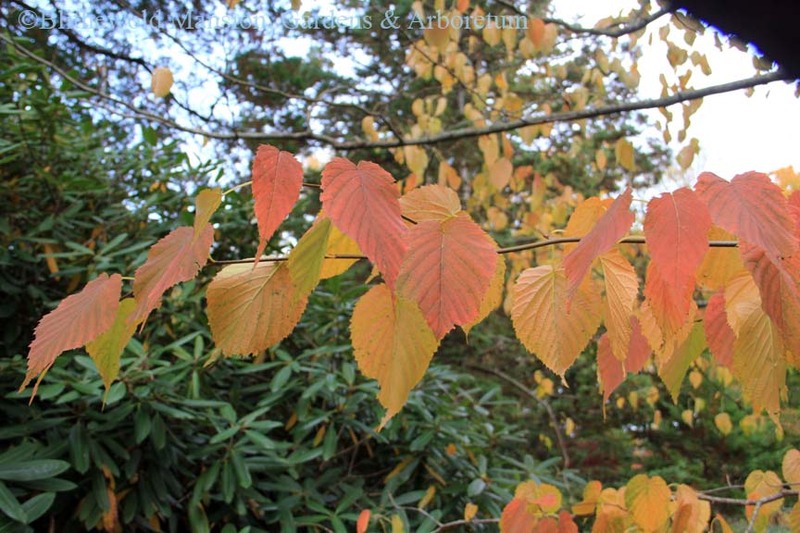 In fall, the foliage turns a soft peach-yellow. The final tree I’ll mention this week is the American elm (Ulmus americana). This tree grows right near the main road and for that reason can be overlooked by the casual observer. Though the American elm is susceptible to dutch elm disease, this one hasn’t shown any signs of decline yet. 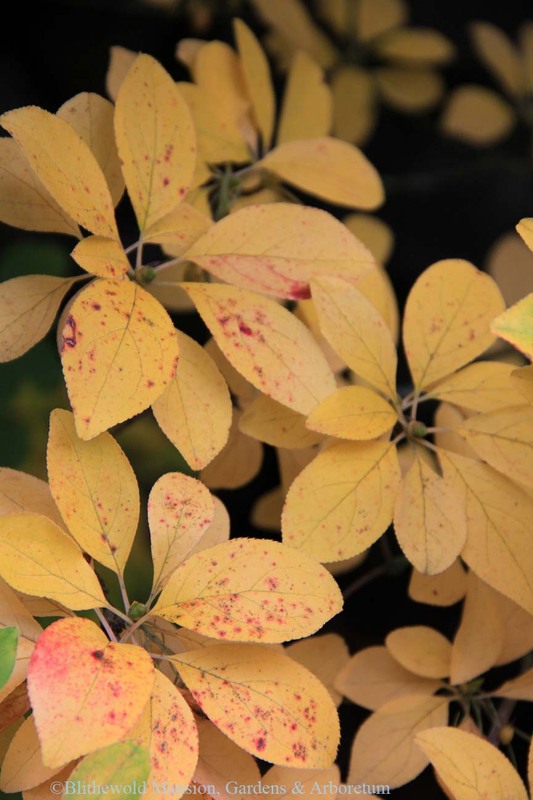 Its fall foliage is a lovely soft yellow, which only adds to the elegant shape of the tree. I hope you have the opportunity to take in all the sights of fall. I’m a firm believer that time spent around gardens and trees is good for the soul. It’s a feast for the eyes and the heart.